The rent at The Triton Apartments ranges from $3,000 for a one bedroom to a $6,500 two bedroom. Apartments in this building are about 20% more expensive than the Foster City average. This is a pet-friendly apartment. This apartment is in Foster City. Nearby parks include Erckenbrack Park, Gull Park and Foster City Recreation Center. The Triton Apartments has a Walk Score of 45 out of 100. This location is a Car-Dependent neighborhood so most errands require a car. 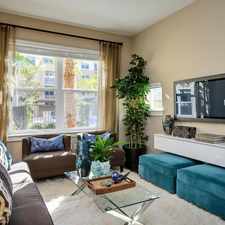 The Triton offers a compelling and urban boutique hotel feel as well as a tranquil peninsula experience in Foster City. These new and intelligent apartments are perfect for Silicon Valley professionals. Each flat, loft, and live/well townhomes space has sophisticated, hand-selected finishes and fixtures. Onsite offerings include pool and spa, fitness center, clubhouse, e-lounge/business center, penthouse lounge with views, bike storage, boat & kayak dock, and much more. Explore how far you can travel by car, bus, bike and foot from The Triton Apartments. View all Foster City apartments on a map. The Triton Apartments is in the city of Foster City, CA. Foster City has an average Walk Score of 41 and has 30,567 residents.